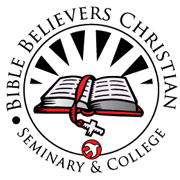 Bible Belivers Christian College and Seminary is a non profit organization and accredited through Transworld Accreditation and Accrediting Commission. We are located in Hawthorne, CA our Chancellor is Dr. Vera Milton. Our courses in Bible and doctrine provide a foundation for life-long spiritual growth. They demand rigorous study and careful thought, and they are always taught with practical ministry in mind. Each professor is an active, faithful, mission minded Christian. BBCCS believes that the goal of education is the development of the total person. The curriculum - biblical and theological studies, psychology and philosophy, arts and sciences, and various professional studies - and the learning environment are designed to encourage students to grow spiritually, socially, physically and professionally. The College offers degree programs in several different areas of study. Students can choose from an Associate Degree, Bachelor Degree, Master Degree and Doctor Degree. BBCCS believes that in an increasingly educated society, cultural literacy is expected, and polished communication skills are essential. BBCCS students are encouraged to serve others, according to Ephesians Chapter 4 verse 11 & 12 And He gave some, apostles; and some, prophets; and some, evangelists; and some, pastors and teachers; vs. 12 For the perfecting of the saints, for the work of the ministry, for the edifying of the body of Christ. Our students may also participate in a mission trip across the globe, a service project in downtown Los Angeles (Skid Row or homeless shelter), or a variety of social, service and honor organizations. These real-world experiences for students build confidence, sharpen skills, and make each ministry more purposeful and real. Preparing students for a real-world ministry is what we do and who we are.